Our primary focus at Milaviate is military aviation, and naval aviation is a very huge part of that. Aircraft carriers have taken on the role of being the most invaluable assets modern navies have in their possession, ever since the Second World War when they proved their worth in the European and, especially, Pacific theaters of war, where they were crucial to destroying Japanese aerial supremacy, safeguarding naval vessels and supporting the invading forces on the ground. Today, there are different classes and sizes of aircraft carriers, most of which eclipse the WWII designs that found themselves in service for decades after the war had ended. The United States and the United Kingdom have generally led the world in naval aviation with experience in the field dating back over a century. However, other countries have ventured into this realm of warfare, post-WWII, as they recognized the strategic advantages of these ships and their embarked air wings. India, in 1957, was one of these countries to join the world of naval aviation when they purchased the former HMS Hercules and commissioned it into service four years later. The Vikrant was joined by Viraat in 1987, an aging Centaur-class carrier. Both ships serve(d) a distinguished career with the Indian Navy, the Vikrant achieving success on behalf of India in confrontations with Pakistan over the years. The Viraat is expected to serve till 2020. As their aircraft carrier fleet aged, India sought to become one of a handful of countries to design and build their own carriers, supplementing their current fleet with the purchase of a former Russian carrier that has yet to be fully completed and declared fit for service. The delay with the Russian deal (which is now expected to enter service by 2018) and China’s latest acquisition, the carrier Liaoning, prompted India to speed up the construction of their own Indigenous Aircraft Carrier (previously named “Air Defense Ship”). Enter the INS Vikrant (R11), the second Indian flattop to bear that name and the first IAC, launched on the 12th of August. 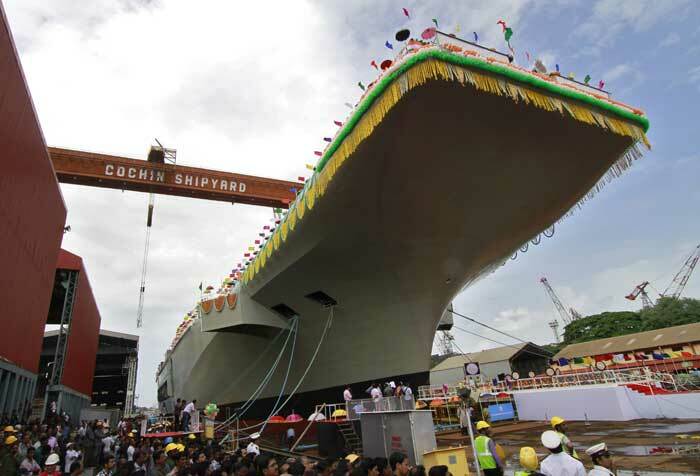 She’ll be the largest warship to have ever been built in India, able to embark a modern air wing of either Russian MiG-29Ks or French Rafale Ns (the latter seems to be the favored choice at the moment), among other AWACS and support aircraft. As expected, reactions to the launch of the carrier were mixed, with China’s being on the neutral to negative spectrum. 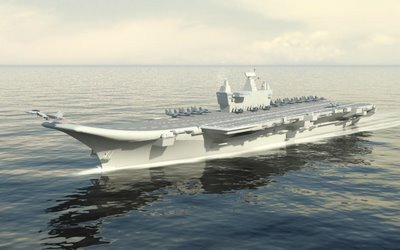 Their media downplayed the Indian achievement of building their first indigenous aircraft carrier, but at the same time seemingly implored the Chinese government to speed up acquisition of their own planned carriers in addition to fully commissioning their current ship into full-fledged service (the Liaoning is still in trial phases as China, being a beginner, is just getting used to naval aviation operations).